The Gunners have lodged a £32m bid for the 25-year-old wing-forward, who would apparently prefer a move to the Emirates than to Anfield, according to the Daily Mail. Barcelona were keen on using Sanchez as part of the deal to sign Liverpool’s Luis Suarez, but it now appears that Arsene Wenger’s side have hijacked the move – with respected Spanish journalist Guillem Balague going as far to say Arsenal have already agreed personal terms with the South American. Sanchez prides himself on his superb technical ability with the ball at his feet. Not only can he retain possession in tight areas, but he can go past defenders from a standing start, thanks to his agility and nimbleness. His pace is also a big asset, but unlike more traditional wingers, Sanchez can drop deeper or into more central areas and link up with his teammates thanks to his clever array of passing. On the surface, Sanchez has no stand out weaknesses. His height means he isn’t usually a threat in the air, but with Arsenal’s intricate style of passing football – this is unlikely to be a problem. What’s perhaps affected his chances at Barcelona is his versatility. He can play on the left of a front three, on the right of one – or through the middle himself, meaning he’s been unable to lock down a guaranteed spot in Barcelona’s XI since his big money move from Udinese in 2011. However, this probably has more to do with world-class players around him such as Lionel Messi, Pedro and Neymar competing for spots – and his performances with Chile at this World Cup show that he perhaps thrives when given added responsibility. Firstly, Arsenal are expecting to sign a new right-back following the departure of Bacary Sagna to Manchester City on a free transfer. The Chilean could form part of a devestating attacking midfield trio alongside the currently injured Theo Walcott, and last summer’s marquee £42.5m signing Mesut Ozil. Due to the injury of Walcott last season, Wenger often deployed Santi Cazorla, Tomas Rosicky and Lukas Podolski in the wide positions, and while all are technically gifted, neither have the pace and direction of Walcott. With Sanchez and Walcott potentially used as interchangeable and dynamic wide-men though, Mesut Ozil’s ability as the playmaker is maximised. The German loves to play intricate through-balls to onrushing teammates, but his ability to do this last term was diminished due to too many static playmakers around him. 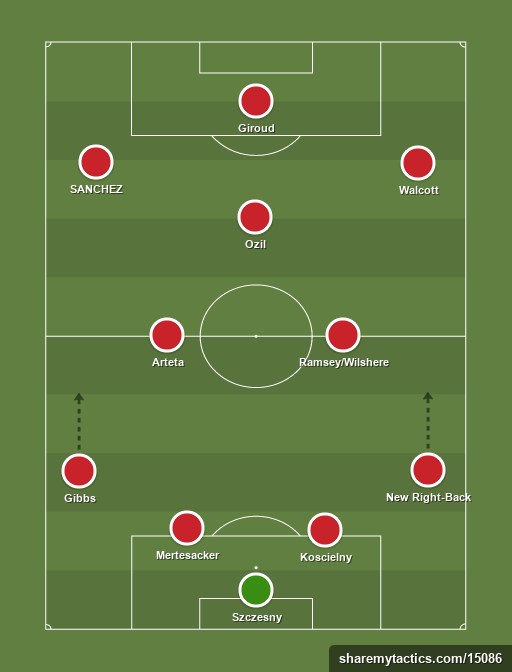 Sanchez then would make Arsenal a far more dangerous side on the counter-attack because of his pace. He would also offer a genuine goal threat from wide (as the stats you’re about to read will prove) and enable Arsenal’s superb passers (Ozil, Cazorla, Ramsey, Wilsere etc) a direct running option in behind the opposition defence. In the top five European leagues last season, only 15 players (including Messi, Suarez and Rooney) reached double figures for both goals and assists, and Sanchez was one of them. While being predominantly deployed on the right wing, he scored 19 in La Liga, and registered 10 assists. He actually only attempted 1.1 dribbles per match, but made 1.4 key passes which led to chances for teammate every game as well. Arsenal football next season ll be a joy to watch if we can seal A.Sanchez’s deal.